Anyone who is planning to get old should read "Enlightened Aging: Building Resilience for a Long, Active Life." I became aware that I had gotten old the day I bent over to pick up a dime off the dining room floor. I realized that I was bending over just like I saw my grandmother do more than 50 years ago, in the dining room of her tidy Eugene bungalow: feet planted wide apart in sturdy shoes, a kind of myopic scrambling to pinch the dropped coin carefully between my fingers before raising myself up slowly like a flag attached to a slightly unsteady pole. 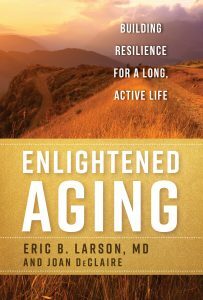 So, last month when Eric Larson and Joan DeClaire’s book “Enlightened Aging” happened across my desk, I decided to read it in preparation for my 64th birthday in September. Larson, ’77, ’78, has spent years of a storied medical career researching aging. Joan DeClaire is one of the best health and medicine writers in Seattle. She has a long history of partnering with UW researcher John Gottman (emeritus psychology professor) in co-writing books about relationships. The recommendations in “Enlightened Aging” are based on a lot of evidence and draw heavily on Larson’s research over a decades-long career. Anyone who is planning to get old should read it. I am already considering giving it to friends at the holidays. There is a lot in the book I didn’t know, and I consider myself quite the wonk when it comes to medicine and health. CT scans may also reveal something doctors call “incidentalomas”—harmless abnormalities like cysts or slow-growing tumors that are unlikely to cause illness and death. Incidentalomas can trigger the “need” for surgery when, really, less is more. I learned that there is a wide range of normal in aging. Accepting this can help us avoid “medicalizing” normal changes of aging. Decreased levels of estrogen in women after menopause and decreased levels of testosterone in men aren’t diseases. They are facts. The best thing to do is work with your doctor to manage discomfort. Some kinds of treatment for these states of being can be harmful. I learned that minimizing stress is very important as we get older because big, stressful changes are more likely to impact physical and mental health. So, my husband and I need to take this into account when we plan stressful changes like moving out of our two-story house. Oh, and Larson has bad, bad news for couch potatoes. He cites a study at the UW and Group Health that tracked 1,740 patients aged 65 and older over a six-year period. Researchers contacted participants every two years to assess things that could affect dementia, including exercise frequency, cognitive function, physical function, symptoms of depression and lifestyle characteristics. After six years, 158 participants had developed dementia, and 107 of those with dementia were diagnosed with Alzheimer’s disease. People, are you ready for this? Those who exercised three or more times a week had a 30 to 40 percent lower risk of developing dementia than those who exercised fewer than three times per week. They also found that the frailer people are, the more they benefit from exercise. Time to hoist those kettlebells! The authors suggest avoiding anticholinergic drugs. Say, what? These are a class of drugs that include common antidepressants, bladder drugs and antihistamines, and they are linked to a slightly higher chance of developing dementia. They include the drug chlorpheniramine, an antihistamine found in popular over-the-counter sleeping aids as well as allergy and cold medications. So, check labels and ask the pharmacist when buying any of these. Be sure to check with your doctor about prescription medications. There are many kinds of care that very elderly people absolutely don’t need and that might actually be harmful, Larson says. Most frail elderly people above 85 years don’t need the stress of colonoscopies—Yay, no more miserable pre-test prep—mammograms, Pap smears, PSA blood tests and other diagnostic procedures aimed at finding cancers, the treatment of which few would survive. I also learned that advance directives may not be enough to keep me off a respirator. Larson and DeClaire recount the story of Carl. At age 91, he traveled the world and had few health problems. But then, in late December, he developed pain in his legs and was too weak to get out of bed. His wife called 911, and the ambulance went screaming to the hospital, where he was admitted to the ICU and put on a ventilator. Carl had an advance directive, but all his wife could think about was saving his life. She wanted the doctor to do everything possible to keep him alive. Long story short: The antibiotics worked, but he couldn’t eat or drink so a feeding tube was inserted. By mid-March, he still couldn’t get off the respirator and he was getting weaker because of problems with the feeding tube. At the end of the month, it was the family’s wish to remove him from the breathing machine and he died. Were Carl’s wishes carried out? For the best of reasons, the answer is “no.” People are not always prepared to execute the advanced directive. Even with an advance directive in place, Larson believes it’s important to do complete documentation spelling out your wishes, and to name someone to make decisions if you are incapacitated. It’s important to have real conversations with physicians, relatives and friends. Difficult to do, but important. I’ll say. So, after you’ve taken a big dose of carrot soup for the evening meal and wolfed yet another serving of kale salad, you might give the University Bookstore a call and order this book. You can read it on the treadmill.